TEVISE mechanical watch has professional craft, durable and comfortable to wear. The stylish and exquisite workmanship will keep you at the forefront of the fashion. 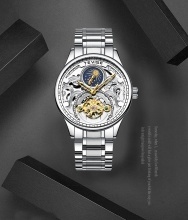 Time display, moon phase, high-quality and classic men&apos;s watch. Strong light transmission, not easy to damage, scratch and wear resistant. Convenient butterfly-shaped buckle design, fashion, simple and easy to wear. Perfect for many occasions. It is a good partner in your life! Daily water resistance (not for showering and swimming). Don&apos;t press any button in the water.